Philadelphia, Pa. − February 1, 2018 − Senator Sharif Street today presented a $500,000 check to the Uptown Theatre following the successful award of Redevelopment Assistance Capital Program funds from Governor Tom Wolf. “The Uptown Theatre has historically been a hub for cultural and economic activity in North Philadelphia and throughout the Philadelphia region. I am pleased to be able to marshal resources to assist in the reimagining of this iconic space on North Broad.” said Sen. Sharif Street, 3rd District. 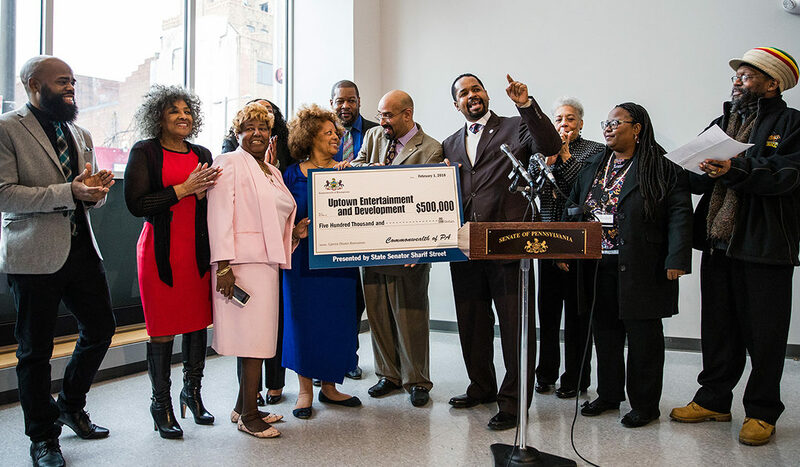 The Uptown Entertainment and Development Corporation (UEDC) oversees the renovation of the historic Uptown Theatre on Broad Street in North Philadelphia where music icons such as The Supremes, Jackson 5, James Brown, Martha and the Vandellas, Stevie Wonder and more performed. Built in 1929, The Uptown Theater became part of the national “chitlin circuit” in the 1960’s providing a venue for African American R&B, jazz, rock and gospel artists to perform. “This is a real kick start to our second phase renovation for the Uptown Theater,” stated Linda Richardson, President of the Uptown Entertainment and Development Corporation. The Uptown Entertainment and Development Corporation is the nonprofit owner of the Uptown Theater acquired in 2004.